The topic of recycling and reusing various everyday plastic objects, and not only the material of failed 3D prints, has been often mentioned by the many projects for filament makers that we’ve seen popping out . They however do not go into much detail regarding the options to recycle plastic and focus mostly on the creation of filament from plastic pellets instead or the reuse of old and failed ABS or PLA prints to make new filament. 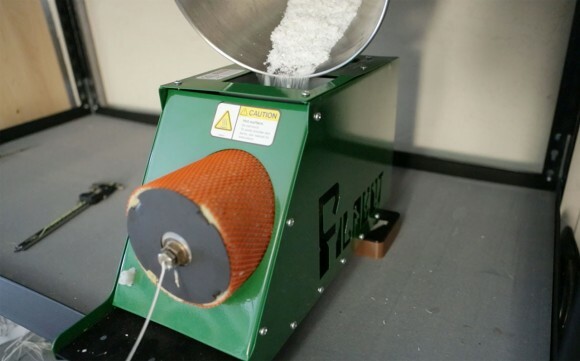 In fact we believe that what the filament maker machines should actually focus on is the recycling and reusing of old plastics from various things that we use everyday instead of throwing away. By recycling and reusing plastic bottles and other plastic products that have ended their lifecycle and we don’t need anymore we can really save on cost of filament and we can actually help the nature from plastic waste. The problem of reusing old plastic that did not come from filament for the 3D printer is that there are may types of plastics and not all of them could be reusable for 3D printer filament and then there is also the risks for your health associated with the recycling of some plastics or their usage afterwards. So as we’ve said it is not an easy topic and you need to go into detail of what can actually be done, what is possible and what is not, what is safe and what is not. It is easier however to just use the word recycle as marketing and not go into detail about the possible usage scenarios of your product for actually recycling and reusing different plastic “waste” as 3D printer filament. When looking at the various plastic products that we use and have around us we should know that they could be made from many different plastic types and it is not a good idea to mix different plastics when trying to recycle them and turn them in a filament for a 3D printer. 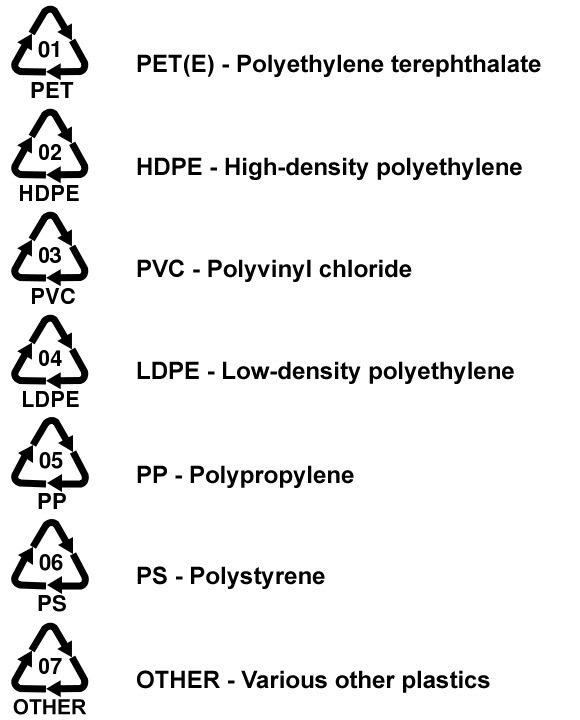 There is a standard classification used for plastics for everyday objects that defines 7 different categories of plastics and if you look at the label or usually the bottom of a product made from plastic you should see a mark showing the respective category of plastic used (like the PET bottle for mineral water on the phpto above). 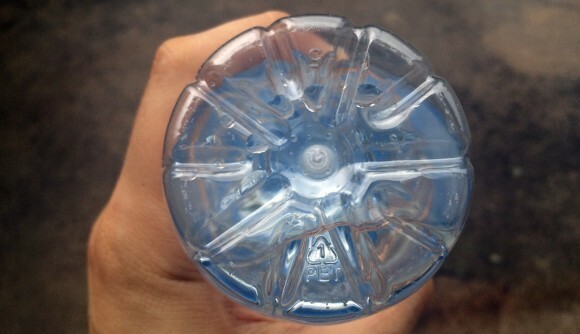 Do note that if something is made from multiple plastic pieces, then there is a chance that different plastics might be used for different parts (the cap of a plastic PET bottle for example). These 7 symbols are being used in most countries, though there could be some variations, to categorize plastic and are called recycling codes. There are similar codes for other things such as batteries, paper and metal, but we are not going to be talking abut them here. If you have been around 3D printing for a while you probably already know that there are much more variations of different plastics used for 3D printer filament and these are not found in the commonly used plastic categories as many of them were actually designed to either replace common plastic types, were adapted or even made especially for use with 3D printers. Out of the seven main types shown above the most used and recycled materials in everyday life are the 1 and 2, but they both are not commonly found in 3D printing filament. One of the most common material used for 3D printing is ABS and unfortunately it does not have its own category – it falls under the number 7, though sometimes we can see the recycle triangle with ABS written inside or under it and no number or the number 7. Out of the first 6 categories only number 1 (PET) and number 6 (PS) have high melting temperatures above 200 degrees Celsius which makes them very suitable for use with 3D printers, the other one is ABS that is under category 7. The number 6 however is not commonly recycled and reused and is in fact not very suitable for 3D printing filament besides the high melting temperature it has, as it is considered possibly dangerous to your health as it may leach styrene. In fact styrene is also used in some of the number 7 plastics such as AS, ABS and SAN… this is precisely why you get warned to print using ABS filament in well ventilated are, because the fumes from heated ABS plastics are not very safe for breathing. The number 7 category is considered the most health unsafe because of the Polycarbonate (PC) plastic that initially was mostly labeled under 7, but is currently less used due to the concerns of it being dangerous to health due to the possibility of it leaching BPA (Bisphenol A), there are come concerns about BPA contained in some plastics under category 3 and 6 as well, so they may not be considered as food safe as well. When talking about food safety even PET plastics that is most commonly used for plastic bottles for drinks is said that may leach Antimony, another not so safe chemical used in the production of the plastics, especially when exposed to higher temperatures. So after a bit of research about safety of plastics, their recycle-ability and features we end up with just two types of plastics that could be viable for recycling and reusing as being relatively safe for 3D printing purposes – ABS and PET. Polyethylene Terephthalate abbreviated as PET or PETE is easily obtainable as we can get it from plastic bottles for various drinks and some other containers. The material has a high melting point at about 260-280 degrees Celsius, so it could be a bit of a challenge for 3D printing without mixing it with something else when making it into a filament for 3D printing. We have actually recently tested a PET-based filament from Innofil3D and were quite happy with the results. So recycling PET plastics for use as a 3D printer filament sounds like a good idea, though the topic needs some research and experimentation with existing filament maker machine (you would also need a grinder for the plastics). Recycling ABS plastics could also be a bit challenging, although ABS is a commonly used plastic type and should be easily found used for various thing around you. The reason for that is that ASB plastic used for the cases of various electronic devices often contains additional hazardous flame retardants. So it could turn out to be harder to obtain safer ABS plastics from everyday items to recycle and remake into filament for your 3D printer. One surprising source of safe ABS plastics is the plastics used in cars such as the one the dashboard and other plastic elements are made from as they do not seem to contain the hazardous flame retardants we have mentioned. But then again obtaining plastic elements from cars that are meant to be scrapped might not be so easy for everyone, so you could look for other alternatives. We do have plans on getting a filament maker machine in the future precisely to be able to experiment in recycling everyday plastic items and trying to reuse them as 3D printer filament. As we have already mentioned this is what is the more interesting function of these machines than to recycle failed prints (you need to have a lot of those to make sense) or to buy cheaper plastic pellets and make filament yourself. Recycling old plastics into filament has its drawbacks such as limitations to the colors you can get for the filament material, usually clear or semi-transparent colors for PET and various colors for ABS, but mostly black or grey and white, though many other colors might be available as well – depending on the source of plastic products. There are also some possible health risks, but you should be pretty safe if you do what is recommended when working with the specific plastic. Interestingly enough there are even some companies that have started selling 3D printer filament made from recycled plastics, and while good for the environment, buying such filament defies the very purpose of getting a filament maker machine to recycle and make cheaper filament yourself while turning some of your personal waste into something useful.